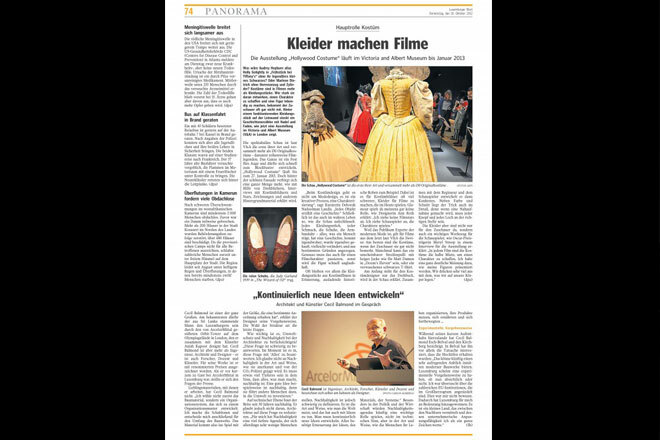 ‘Cecil Balmond ist aber mehr als Ingenieur, Architekt und Designer – er ist auch Forscher, Dozent und Künstler.’ – ’Cecil Balmond is more than an engineer, architect and designer – he is also a researcher, lecturer and artist.’ The Luxemburger Wort features a Q&A with Cecil Balmond after attending his lecture at the ArcelorMittal HQ last month. Click Read More for full translation. How important is it to take account of environmental protection and sustainability in architecture? “This question is difficult to answer. At the moment it is popular to answer this question with ‘Anything’. I do not believe in sustainability in the way as it is recognized and chased by police of CO2. It has to be something much deeper in the sense that everything that you do, is sustainable. A good idea, for example, is sustainable because it leads other people to invest in the environment.” He does not believe in reducing architecture to this question.